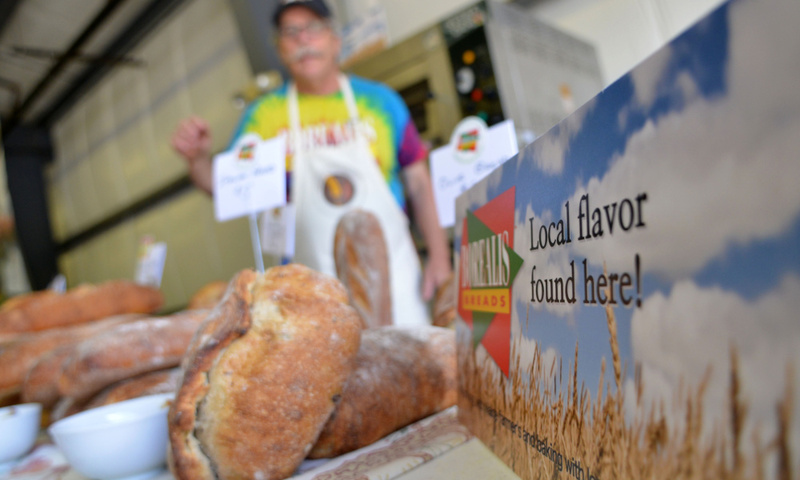 The bread fair, founded in 2010 as a simple lecture on food, now fills Constitution Hall on the Skowhegan Fairgrounds, and will transition to the midway Aug. 11-20. Semolina levain. Buckwheat oat porridge bread. Carrot, corn spelt vollkornbrot. Pretzels and whole grain crackers. Bread and all the cheeses, jams, sauces, utensils and equipment to go along with eating and making it were featured Saturday at the Skowhegan State Fairgrounds for the annual Maine Artisan Bread Fair. The fair, which showcased 65 vendors and attracted about 2,500 people, was the culmination of the 10th annual Kneading Conference sponsored by the Maine Grain Alliance. The bread fair brought people from all over Maine and from as far away as New York and New Jersey. Amber Lambke, alliance co-founder and owner of the Somerset Grist Mill in Skowhegan, said the two day Kneading Conference and bread fair are important to reacquaint the community with the old ways of making and eating good food that is locally sourced, while strengthening self reliance. “The Kneading Conference is important because it is focusing on how we rebuild regional grain economies, not just in Maine, but all over the country where they used to exist,” Lambke said. “And when that happens, there’s a chain effect helping farmers, bakers, brewers, oven builders, millers that form an interconnected economy around food, so we learn to rely on each other again and make good nutritious products. 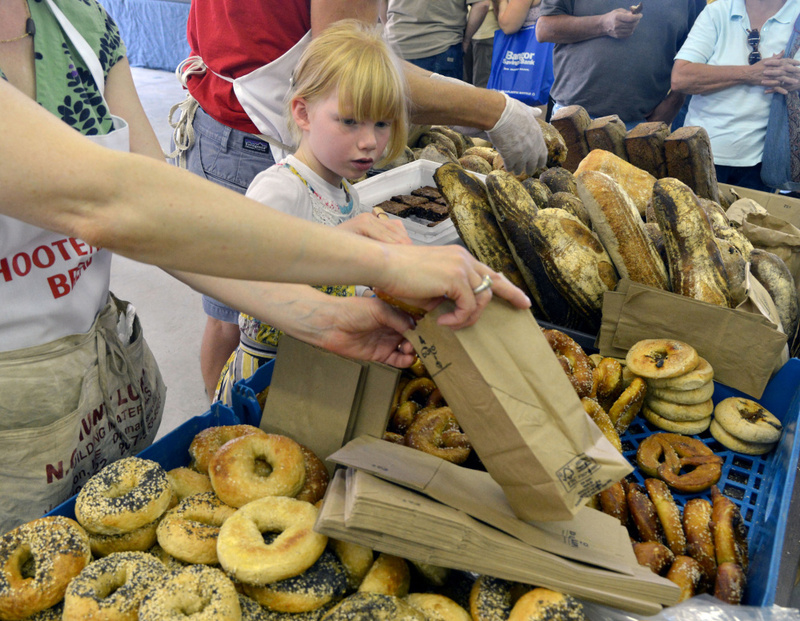 The bread fair, founded in 2010 as a simple lecture on food, spread this year to fill Constitution Hall on the fairgrounds and onto what will become the Skowhegan State Fair midway Aug. 11-20. There were vendors selling handmade baskets, pottery, artwork, knitted scarves, books on baking bread, wood-fired pizza, local beer, wine and live music. And lots of homemade bread, some baked right on site. Bangor City Councilor Ben Sprague visited the bread fair Saturday with his wife Malorie and their two children, Abby, 1, and William, 21/2. Wearing a Bangor Green Drinks T-shirt, a local group that supports projects that make the community more sustainable, Sprague said locally made products have a far reaching effect both economically and gastronomically. The family had some wood-fired pizza and bought some food to bring home to Bangor. Malorie Sprague said she liked the blueberry scones from the bread fair and purchased some local bread. William Sprague, wearing a Red Sox cap (he worked for the team for three years), said his favorite was the pizza. Over at the Maine Grain Alliance sales table, Amanda Dewald, from upstate New York, said the breads for sale were the result of a two-day production workshop as part of the Kneading Conference. All of the participants produced the loaves for sale at the fair to benefit the alliance, she said. Visitors Chuck Boyer and Kate Dunham, of Philips, said they were browsing the bread fair for good things to eat and take home. Dunham said she comes for the bread and stays for all the good things that go with bread. “I like finding good artisan bread and good artisan cheese,” she said.